As an artist, I’m suffering from several issues that have targeted my ability to create, including anxiety, and a disgust for anything I write (words are my primary artistic medium). If you can relate to this, or are feeling bogged down by the grittiness of life as an artist, listen. If you’re an artist of any kind, or want to be one, there’s a good chance you will benefit from the insight expounded here. The Crowd, the Critic, and the Muse is divided into three parts. In the first and shortest section, Gungor focuses on the definition of art, what it is, who partakes in it, and who makes it. He argues that everyone is an artist, to one extent or other. In the next part he goes into the roots of our culture’s art landscape, discussing, among other things, how technology has both helped and hurt the production of art (he focuses specifically on the music industry), and how the sheer volume of entertainment in our culture has made us numb as consumers, and even as artists. In the third and final section, he discusses good soil to plant our art in—Faith, Doubt, Hope, and Love. After expounding on the role of each of these in the artist’s life, he wraps up with a powerful benediction to his fellow artists to keep their eyes and hearts open, and to do God’s work in their artistic endeavors. 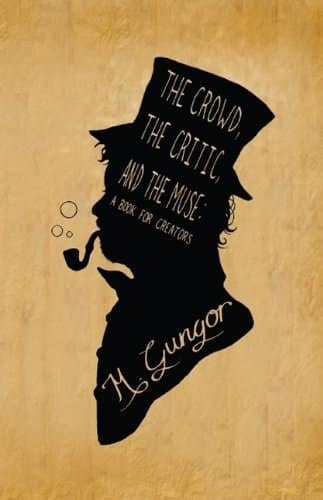 The three voices—that of the crowd, the critic, and the muse, are a common theme throughout the book as Gungor draws from his own experiences and misadventures the formed and resulted from listening to each of these voices in his own artistic career as the leader of a band. He examines each of these voices and shows the good and bad influences they can have on an artist when they are allowed to. There are also a few great appendices that expound on related issues, most notably one about the Christian-izing of everything, aptly titled Christian Pizza. Gungor’s writing style is easy to read, and down-to-earth. You know he’s talking directly to you, and that more than makes up for the few places where his editor missed a typo or poorly-worded sentence—the message still shines through and, in my case, empowered me as a broken artist. Gungor writes as a Christian artist, and some of his theology is a bit hard to pin down—I can’t stand behind everything he’s said, but I hugely benefited from it as a whole, even where I outright disagreed with him and had to think for myself about what I believe and why. My disagreements with him never resulted in his advice and insight being useless to my perspective. Some of the anecdotal stories are a bit strange, and not ideal for young artists to read, at least not without their parents’ permission and guidance. There’s also a smattering of “swear words” here and there, but nothing over-the-top or, in my opinion, inappropriate for most readers. As a whole, The Crowd, the Critic, and the Muse has played a significant role in my healing as a writer, though I have a ways to go yet, I’m finding; and I fully expect to be reading this book again, either in its fullness or specific sections as needed. Whether you think of yourself as an artist or not, go out and make. Do your work as unto the Lord and enjoy Him in whatever He’s called you to do.